You are currently browsing the category archive for the ‘Zionism’ category. I can still very clearly remember when, in my early twenties, I had a job in a factory making stainless steel and Aluminium cookware. We started work at 6:30am each day and finished at about 3:30pm. 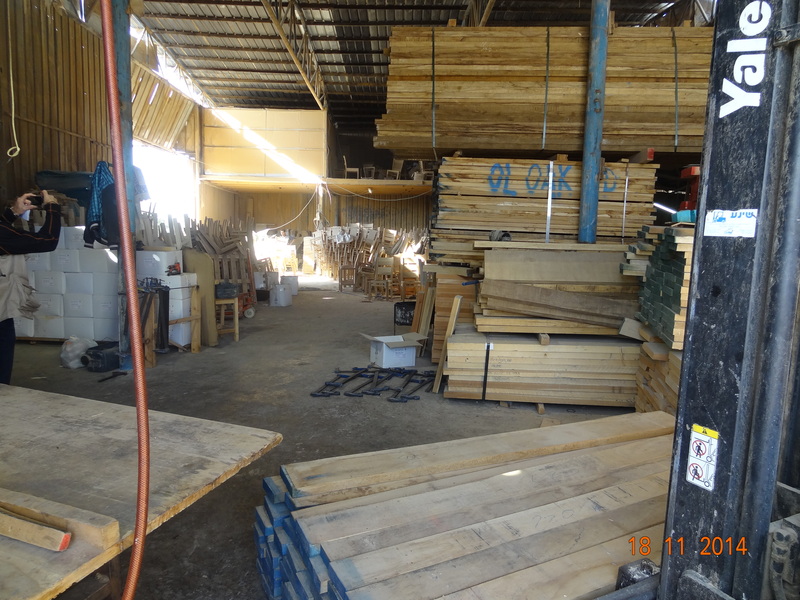 The shed that we worked in was freezing cold in winter and boiling hot in summer. The work was boring, repetitive, dirty and very labor intensive. At that time I was sharing a two bedroom flat with two other friends and for some reason, that I don’t remember, I had to sleep on the floor every night. I had to get up at 4:00am in the morning to catch two buses across town to get to work on time. It wasn’t fun! So while I was monitoring the infamous checkpoint at Qalandya, I couldn’t help but think back to those days. That morning we got to the checkpoint at 4:30am and my team mate Peggy, stood on the exit side of the checkpoint to count people as they came out, and I went to the entry side to monitor things as people lined up to enter the checkpoint. 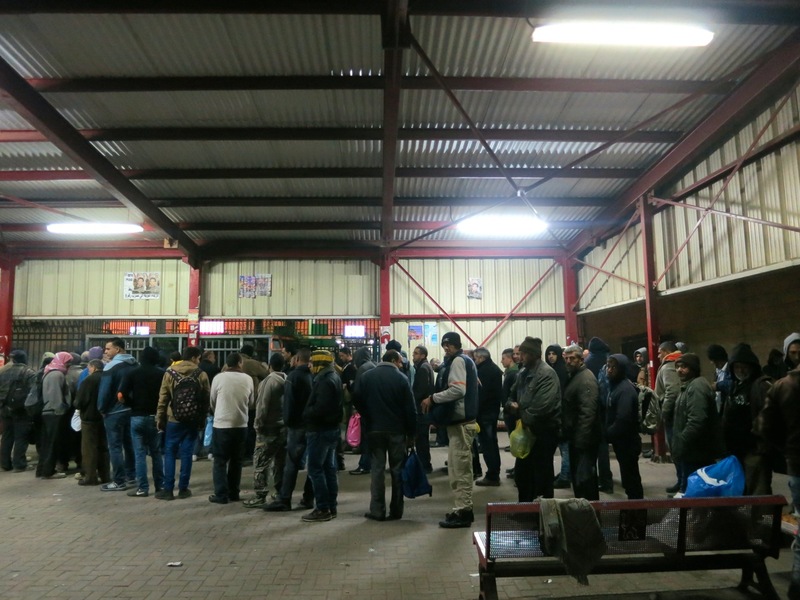 Even at 4:30am, the checkpoint was crowded with people trying to get to work in Jerusalem. The Qalandya checkpoint basically separates the Palestinian town of Ramallah (and hence the whole of the northern West Bank) from Jerusalem. The checkpoint itself consists of a large shed where people line up in what can only be called cattle shutes, which lead to turnstiles at the end of each shute. The opening and closing of these turnstiles are controlled by Israeli soldiers who sit in a main control room. On the other side of these turnstiles are five booths, each with its own turnstile controlled by soldiers in each booth.Once you get past this set of turnstile,s you must show your ID papers to the soldiers on duty, place your belongings on the conveyor belt to be X-rayed and walk through the metal detector. If the soldiers at the window of the booth are satisfied with your ID card and permit and everything else, you may pass through the checkpoint and go into Jerusalem. On a goodish day this can take 20 to 30 minutes. On the day that I was monitoring the checkpoint, all 5 booths were open but for some reason the lines were moving slowly. By about 5:10am the lines from all three shutes were so long that they extended way outside the shed into the car park behind the checkpoint. As time passed by, the people in line became agitated with the soldiers and some made gestures to me wanting me to do what I could to get things moving faster. I made a few phone calls to the Humanitarian Hotline and Machsom Watch but nothing seemed to be changing so far as the time to process people was taking. Many of these Palestinians are day workers in Jerusalem and are desperate to get to their places of work since many of the companies they work for simply take the first lot of workers that arrive on time and forget about the rest. So being first off the ranks is very important for many people even at this early hour. The employers in Jerusalem seem to have no interest in improving conditions at the checkpoint in order to speed things up and get people to work on time. Buses on the exit side of the checkpoint taking the workers to their places of work in Jerusalem don’t wait for stragglers. By about 6:10am some people, in absolute desperation, started trying to push in at the front of the line near the end of the cattle shutes. This created a “panic” of people in the line and suddenly about 100 workers stampeded the opening of the three shutes! It was chaos as all order broke down. Many people gave up and just sat down inside the shed and waited. Some knelt down and started praying, but for at least 50 or 60 people, they continued to try and push and shove their way into the openings of the cattle shutes in order to go through the checkpoint. Some Palestinian people next to me blamed the soldiers for causing this chaos, saying that the soldiers were, in their opinion, deliberately holding the lines up so as to incite the workers. Whether the soldiers were in fact doing just that, is debatable, but anyone can see that such a system, in the context of the occupation. will be doomed to failure and cause a huge amount of tension and malice between the two groups. The situation continued like this for over an hour and I have to admit that I felt quite scared at times. I could not imagine having to face the prospect of this every morning in order to get to work. A number of Palestinian men told me that they had to miss work a number of times because this sort of chaos had ensued at the checkpoint. It only increases their sense of desperation to get to work the next day. One struggles to find a rational reason for why this checkpoint is the way it is. Israelis will often tell you it is necessary because of the suicide bombers of years gone by. I struggle with that explanation as there are a number of worker checkpoints from the West Bank to Israel that can cope with far more than twice the amount of people getting through the gates of Qalandya. I have monitored some of those gates myself. So far as security goes, everyone knows that many hundreds of Palestinians get across into Israel from the West Bank “illegally”, every day. International Law states that Palestinians under occupation in Gaza and the West Bank are protected persons. at Qalandya, it doesn’t look like it! The Government of Australia pretty much tows the Israeli Government line that Israel has no partner for peace because of the alleged Palestinian refusal to refrain from violence/terrorism. The notion that Palestinian violence/terrorism might stop if Israel stopped oppressing Palestinians is not seriously considered. Maybe if more members of the Australian Government (and people) understood the facts on the ground, this attitude might change. A case in point is that of house demolitions. Although the Israeli military has reinstated the practice of demolishing the homes of terrorism suspects and their relatives (against International Law), the vast majority of demolitions have nothing to do with acts of violence from Palestinians. These demolitions are a result of the planning and zoning policies of the Israeli Military, who govern the West Bank. There have been nearly 25,000 house demolitions in the West Bank since 1967 and over 90% of them have nothing to do with punitive measures against terrorism. All house demolitions in the West Bank by the Israeli Military are just as illegal under International Law (4th Geneva Convention) as the Israeli settlements that Israel is so determined to build. These zoning and planning policies are chiefly devised to facilitate the construction of Israeli settlements and the accompanying infrastructure. As the Mayor of Bruqin told us, “They (the settlers) get houses and settlements, we (the Palestinians) get demolitions!”. Allowances made in the policies for the expansion and development of Palestinian housing and infrastructure are grossly inadequate. Nearly 70% of the West Bank is designated area C, for Israeli settlements and areas that come under full Israeli control. Palestinian homes and structures in area C are extremely vulnerable to demolition orders and building permits are virtually impossible to get even if the building is to be done on land that a Palestinian can prove is their own. Obtaining a building permit is extremely expensive and statistics show that there is a 97% rejection rate of building permits in the West Bank. To even get the proper documentation together, which includes a very expensive land survey, for the application, can cost tens of thousands of shekels. Sometimes the cost of the application is more than the cost of the construction of the structure itself. These factors combined leave Palestinians with little choice but to build without a proper permit, hence leaving themselves open to demolition orders. Another problem seems to be that the exact location for area C seems to be very hard to assertain. Area A, under full Palestinian control (in theory anyway), is for the highly concentrated areas of Palestinian population, like the towns of Bethlehem, Tulkarm, Nablus, Hebron, Ramallah, Qalqiliya and so on. Area B is for slightly less built up areas with area C taking up all the rest of the space. The only contiguous zone is that of area C. Area A and B comprise some 227 enclaves of Palestinian population “swimming” in an ocean of Area C. Yet we have been shown a hospital and main road right down the centre of Tulkarm which is designated area C.
Structures most vulnerable to demolition orders are those closest to the separation barrier, Israeli settlements, settlement roads and military zones. But this is not always the case. We discovered this when we went to the village of Hajja last week after hearing that six new demolition orders had been given by the Israeli Military. Amongst the buildings set to be destroyed was a furniture factory in the middle of the village which employs 45 people and a banquet hall. As well as this, there included a number of beautiful houses all of which were not within 10 kilometres of any type of Israeli settlement or settlement infrastructure. The logic seems hard to follow. 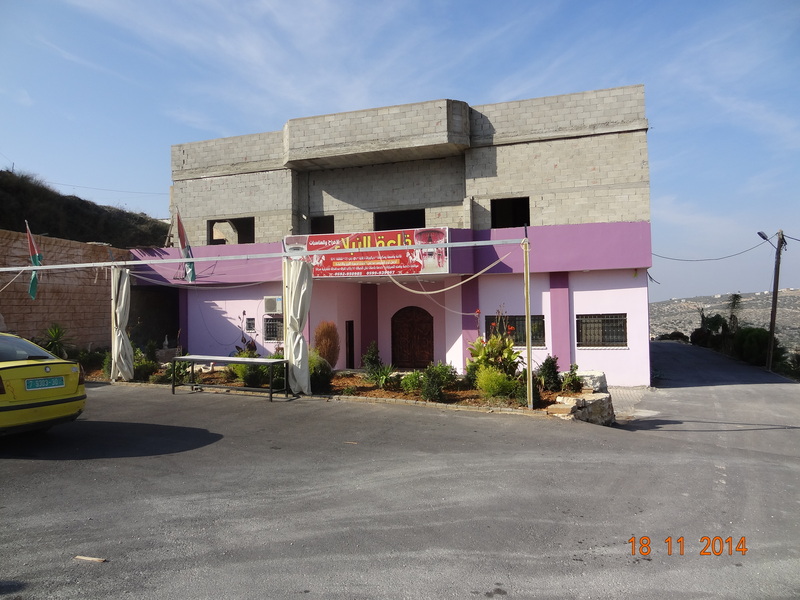 Banquet Hall in Hajja, soon to be demolished. Furniture factory in the middle of Hajja, also soon to be demolished. According to sources that I have been talking to over the last few weeks, it is virtually impossible to stop the demolition of a structure once it is ordered. Generally the best that can be done is to delay the demolition. It must be remembered that the cost of the demolition falls on the people whose structure is demolished. The only way to avoid this cost is, for the people owning the structure, to do the demolition themselves. We know of a case, in the village of Farun, where a man had been slowly building his dream home for his family for some 20 years. He started building the home before the separation barrier was even started and on the day that he finished building his house and was ready to move in, the house was demolished by the Israeli Military because it was too close to the barrier. I have seen many Palestinian houses closer to the barrier than the one in Farun that have no demolition order on them. Since our EA team has been in the West Bank (5 weeks), there has been 84 structure demolitions displacing some 247 persons, according to OCHA’s protected persons weekly reports. With the housing situation already in crises due to land confiscation, poor planning and zoning policies and the desperate state of the Palestinian economy, these people are left in a desperate situation to say the least. A recent increase in the number of house demolitions in East Jerusalem, along with threats by right wing settler groups to blow up the Al Asqa Mosque and the Dome of the Rock and added to that the deaths of 6 Palestinians and injuries to nearly 600 others ( all in the last 5 weeks), all add up to a massive level of incitement by the Israeli Government that goes largely unreported in the western media. Ordinary Palestinians keep asking me how it is that any country can take Israeli Government statements about the Israeli desire for peace seriously, when they continue to maintain this “status quo” of violence, land theft and dispossession. I struggle to give them an answer that makes any sense. 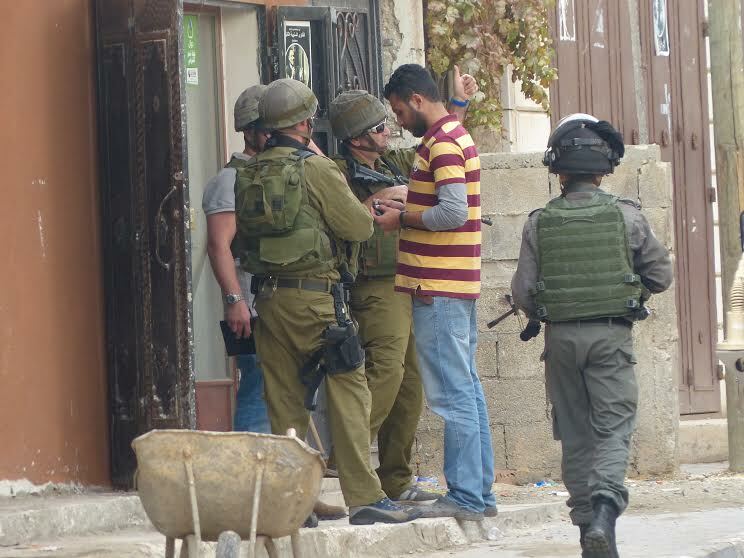 “Let me tell you something my friend…”, said Abhul Kareem, a longtime field worker with B’Tselem, “ …if you resist the occupation, you will get arrested!”. Abdul Kareem’s response was prompted by my question relating to the reason for the arrest of a particular person that he had just been talking about. Abdul’s facial expression was strained, but trying to hide his frustration with a question that he had obviously been asked many times before by foreigners who don’t understand what life in the occupation is really like. In my country, Australia, if someone has been arrested, then they have likely committed some type of criminal offense, be it minor or serious. The experience of being arrested or confined in prison is a relatively rare event (in terms of population) and not something people are usually very proud of and hence it is a fact not greatly advertised. Over here in Palestine, things are different. As I have been travelling up and down the West Bank, I have found it difficult to find many males above about 20 years of age who have not been arrested or imprisoned. Never, in any case of meeting such person’s here, would I have guessed that any of them had experienced such things. At home, things are different. Having had more experience with the prison system back in Australia than I would have liked, I think I can generally guess (but of course not always) when someone has had a prison experience/background without asking them the details. So I took this comment from Abdul Kareem on board when I visited a “Prisoners Sit In” that is held in front of the offices of the ICRC (International Committee of the Red Cross) in the village of Tulkarm on the north western side of the occupied West Bank. This small protest is attended by family members of Palestinians who have been arrested and are currently serving prison sentences of up to 20 years. A long wait for justice. On arriving at the protest, I casually walked up to the people sitting there, holding up photos of their loved ones, and asked if anyone spoke English. Upon finding an interpreter, I knelt down and started trying to get details of the people’s family members who were in prison. One of my team mates was trying to take a picture of the people at the protest and without thinking he called out, “Smile!” Immediately one of the parents at the sit in called back, “Why should we smile?”, “What for?”. It was a heart breaking moment. The first person I interviewed had a son, Mohamed Khateeb, who had been in prison for 12 years. He is now 31years old. He was sentenced to 21 years prison and was initially arrested in the middle of the night. According to his father, the trial was a joke, the lawyer did nothing to defend Mohamed. The family believes that the court’s decision was made before the trial even started. Mohamed is being held in a prison inside Israel (contravening International Law which states that a person cannot be sent to a prison outside his/her country for an offense committed in their own country). Being in Israel means that his family cannot visit Mohamed or even write to him. Some of Mohamed’s other relatives have managed to visit him but only once a year. The family mostly gets news about Mohamed when other prisoners are released who have been inside with him. As I went down the line of family members I started to realize that the same picture was being painted each time. 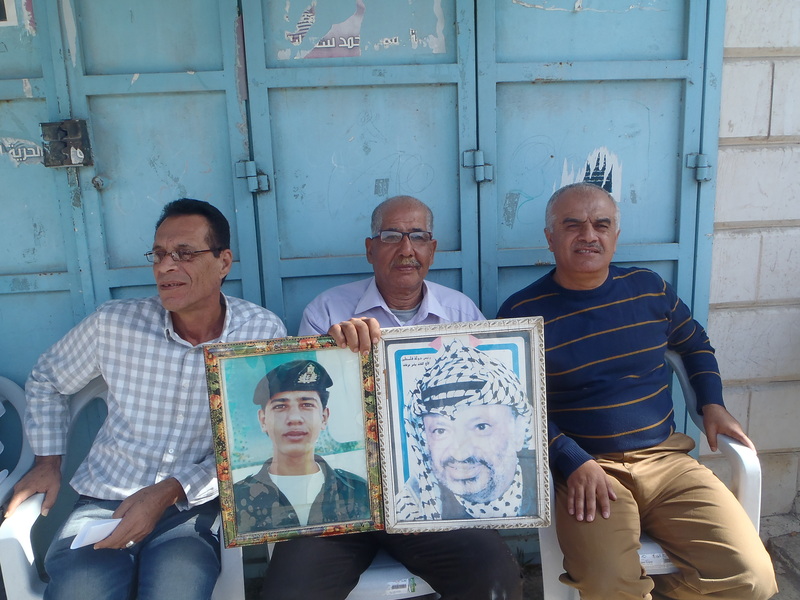 Their sons had been arrested in the night, had been given long prison sentences by courts that were a joke in so far as justice was concerned and were all sent to prison inside Israel, preventing any type of regular contact with family members. All of the parents and family members believed that the harshness of sentencing depends very much on the political situation at the time. When Palestine tried to petition for member status in the UN, for example, the sentences handed out to people like Mohamed, were longer than normal. The courts that they attend are all military courts regardless of the offense committed. Israelis in the West Bank do not come under the jurisdiction of such courts. As Israelis they come under Israeli Civil Law. Civil Law has much higher levels of evidence needed to obtain a guilty verdict than Military Law. The interviews became a bit too much for me to bare after a while and I had to stop. None of these families deserved the agony they were going through. The relatives of bank robbers and murders get better treatment in my country and none of these young men had committed crimes like that. Believe me, if they had done so, they would have gotten life imprisonment or be dead and their parents would have had the dignity to admit as much and accept the consequences. The truth is that these young men had all been active in demonstrations and other non-violent forms of resistance. The more effective or more articulate you are in your resistance activism, the more likely you are to be arrested and given a prison sentence. The parents and family members of these men are not fools. They know how their sons and daughters are portrayed in the Western Media. They know that they will be judged as terrorists, especially by people in countries like Australia, that support the Israeli Government so strongly. Their lonely vigil and cry for justice will fall on many deaf ears in the Western World. In the end, all I could do was to ask the interpreter to tell the people that I was sorry for the injustice that is tearing their families apart and that I promised to tell their stories and advocate for them when I get back to Australia. Upon hearing this their faces light up with smiles of gratitude. They know that I can do nothing to get their loved ones out of prison, but I guess that when other people acknowledge their pain and sense of injustice and believe in their goodness and decency, it gives a reason for these people to smile, even when otherwise they can find no reason to be happy on such an occasion. Armoured vehicles enter the village. Last Tuesday, 4th of November, I was taking a short nap around 2pm back at our EA house in Jayyus. As usual, we had a very early start that day, getting up at around 5:00am to travel to an agricultural gate in the north-eastern part of the West Bank near the village of Qaffin. We had been hard at it until we got back at about 1:00pm due to some very annoying problems that arose at this gate. More on this in a later post. So at about 2:00pm I was woken from my slumber by a phone call from one of my team mates, Zoe, from Canada. I answered the phone, still half asleep, and to the best of my ability all I heard was that the rest of the team were outside the house on the street having cake! That sounded pretty good so I staggered out of the large iron gate at the front of our house only to discover a complete lack of anything remotely like cake. Some of the young boys in the village were yelling excitedly and after a minute or so I realized that what was getting them excited was the fact that five armoured vehicles, full of Israeli soldiers in full battle dress, all carrying automatic weapons, had entered the main street of Jayyus and were going up and down the street questioning people and asking for their ID’s. 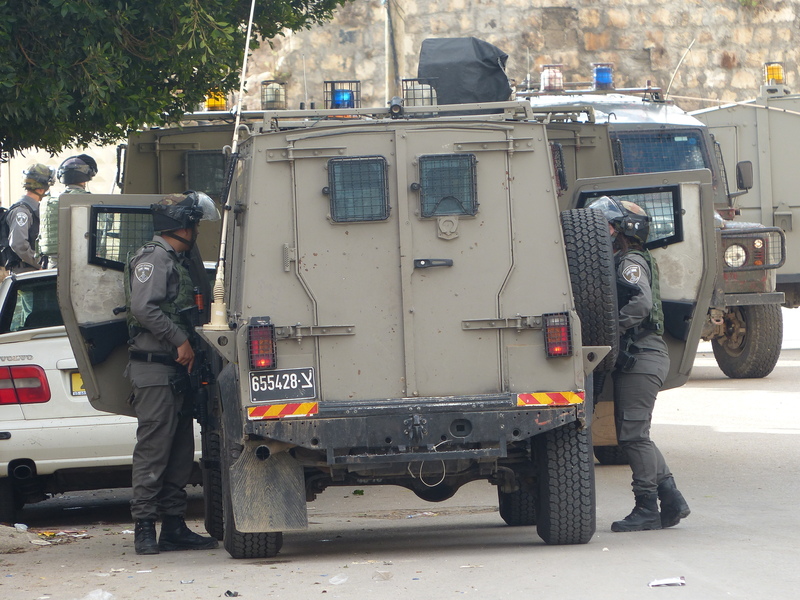 This had not happened in the village for at least a month, and as I looked down the main street I could see a number of my team mates talking to Israeli soldiers. The Israelis told my team mates to get off the street and just as they started to do this, some of the young kids in the village began throwing stones at the soldiers. The soldiers immediately responded with tear gas and sound bombs and the whole cat and mouse game between the young boys in the village and the soldiers began. My team mates and I ducked into one of the nearby shops in the main street and watched from a distance. After about 15 minutes of this “game”, the Israelis got in their vehicles and as they drove passed us, one of the soldiers sitting in the front of the armoured car politely waved to me as he went by. I thought that this gesture was somewhat incongruous with the mood of the afternoon, but about 10 seconds later I realized that this gesture was one more of ridicule, rather than hospitality. The reason being that at that very moment, the tear gas came onto us and its effects were immediate and extremely painful. In what was literally a moment of blind haste, we ran to our house in a mad rush to get some onions to cut up and breathe in, to stop the effects of the tear gas. After a few minutes, we felt better and were able to gather ourselves and return to the house, but with no cake! Our driver, Abed, informed us that this incursion was child’s play when compared to what used to happen in the years during the second intifada. He said that in those years the Israelis would come into the village and put tear gas directly into people’s homes, cars and even the Mosque. Having got just a relatively small dose of this gas, I can hardly imagine the effect on the young and the elderly, who cannot move as quickly as others can, when being caught in an enclosed space with a cloud of gas. Abed said that after once having tear gas thrown directly into his car, he could not use it for two days, even after washing it several times. Another tactic that Abed related was how the soldiers opened fire on the black water tanks that are so conspicuous on the tops of Palestinian homes. If the tank was hit near the bottom, then the tank would be rendered useless. In one incursion the Israeli military destroyed 100 water tanks. Abed said that he has been gassed so many times in his home village of Jayyus that he has permanent breathing problems. All these events are just one more part of the huge picture of negative effects of the occupation that are just part of daily life in the West Bank and Gaza. This is a world that still seems unbelievable to me even as I am here, embedded in the occupation myself. I’m just grateful that I don’t have to live in it permanently. I wish no one did. All UN member nations, including Israel, are signatories to the Fourth Geneva Convention. This convention outlined the treatment of the civilian population of an occupied state by an occupying state. My interpretation is that basically an occupying state must virtually take on the role of a normal government of the occupied state. In other words, if say, my home country, Australia, was occupied by Japan, as was nearly the case in the Second World War, then the Japanese occupying force would have to assume the role of the Australian government in all the areas that the Australian government would normally need to take on. The difference being that while the government is normally elected and tolerated quite well, even by those who didn’t vote for it, an occupying power is considered a hostile entity and has the competing role of maintaining the security of the occupying forces themselves from the occupied population. The role of the occupying forces is not small, or inexpensive if it wants to maintain an occupation and stay within the limits of International Law. It must, as a minimum requirement, protect the rights of the occupied people just as if they were a normally elected government and try to satisfy the security needs of the occupying force as well. This is indeed a difficult task, but that is just the point. International Law is not there to make an occupation easy. An occupation that satisfies the minimum requirements of International Law would put an immense strain on the resources of the government of the occupying force and it is supposed to. In this way, International Law is trying to deter an occupation from continuing for an extended period of time. Put simply, if you can’t afford to maintain an occupation and satisfy the requirements of International Law, then get out of the country and end the occupation! Over the last two weeks I have seen how, in numerous instances, the Israeli occupation of the West Bank and Gaza violates International Law in grievous ways, all over the territories it occupies. The question is, “How does Israel justify all these obvious violations of International Law?” The answer that Israel offers is that the Fourth Geneva Convention does not apply in this case because these conventions are meant to be applied between states, and the West Bank and Gaza have never had proper Palestinian governances and hence cannot be considered as a state. That is, Israel is not occupying the West Bank and Gaza in a manner that would invoked the Fourth Geneva Convention. It needs to be said that no country, the US included, accepts this answer. This is clearly a matter of semantics that completely misses the point of the conventions. But even if the Israeli answer is correct, and it has indeed found a loop hole in International Law, then what can we say about the attitude of the Israeli state? In my mind, if any state is actively looking for a loop hole in International Law that enables it to opt out if its obligations to uphold human dignity and human rights like any reasonable government should, then that government was never terribly interested in the concept of Human Rights and Humanitarian Law in the first place. Regardless of whether or not the Israeli argument on this point is correct, they have lost the moral argument at the very least. The testimony of my own eyes over even the last two weeks has only confirmed this point to me. Zionists, and other supporters of the State of Israel, are quick to demand that opposition to the policies of the Zionist State that oppress the Palestinian people, has nothing to do with a desire for justice and equality, but are based simply in racism and hatred towards Jewish people. In other words, those who claim to oppose Zionism, are not motivated by a desire for freedom and equality, but are just using the issue as an excuse to vent their hatred of Jews and or western society. In my previous years as a card carrying member of the religious right, I believed that all people on the left were basic hypocrites in that while they would stand all day in rain, hail or shine protesting against abuses of human rights, they themselves had an agenda that showed their true intent. These hopeless dupes of the left (be it secular or religious) were inwardly haters of humanity and all Godly concepts of human freedom! They would have us enslaved to an authoritarian state in a beehive like social order. In the final analysis, their so called desire for justice and equality was nothing but a sham! Or so I thought. Palestinians are continually portrayed as Islamic extremists and anti-Semites. This despite the fact that Judaism and Islam have existed side by side in the Middle East for hundreds of years in peace and mutual respect. In all those centuries, neither the Koran nor the Torah changed. What changed was the creation of the Zionist state, facilitated by Europeans whose racist views laid the basis for their colonialism and imperialism. I believe that European chauvinism is what lies at the heart of this conflict in the Middle East. The idea that there are inferior people groups, or races, in our world and that there are those of superior stock who have an entitlement to take from those of lesser races that which did not originally belong to the higher grades of humanity, was not an idea held to exclusively by the Nazis of Germany in the 1930’s. This type of thinking explains how Europeans can come to Australia or Zionist Jews to Palestine and apparently see “a land with no people”, or, “Terra Nullius”, in the case of my home country. It is not that they didn’t see any people in the land, it is that in their eyes they did not see a people who were of a high grade or quality or who were worthy of being in charge of their own destiny in the land of their birth. The Red Indians of America, the Aborigines of Australia and the Arabs of Palestine have all been invisible to the eyes of Europeans (be they Zionist or otherwise) when it comes to a consideration of their rights and needs. They simply are not the equals of us Europeans and hence do not have the rights that we do.Hence allowing democracy for Arabs in Palestine was never a priority for the British Mandate or any other western nation. Democracy is not for savages! Obviously the Zionists considered that right from the outset an Arab vote should never be equal to a Jewish vote in Palestine. While in Israel today an Arab has a vote of equal numerical value to the vote of a Jewish person, the ethnic cleansing of Arabs from the state of Israel in 1948 and subsequent immigration laws that ensure that Jews always have an 80% majority in Israel adds up to the same situation of impotency at the ballot box for Arabs in Palestine as it would if the idea of one Jewish vote equals one Arab vote had never been thought of. Arabs inside the state of Israel are a people under constant suspicion and control. Their loyalty to a nation that only really tolerates their presence is always considered to be dubious. They are a people with conditional rights WHILE IN the land rather than unconditional rights TO the land as Jews have under Zionist rule. Israel is a Jewish state according to Zionist ideology, not Biblical scripture. The following article was written by Philip Jarman. In it he discusses some of the theological short comings of Christian Zionism. Philip is a regular follower of this blog and this article is his personal reflection on this issue. This paper is my summary challenge to Christians who argue that there is a supportable interpretation of the Bible regarding Israel’s activities in the land of Palestine. I contend there is No such support. Christians in our generation need to know that there is historical scholarship for a valid Biblical point of view which dissolves the arguments that support Christian Zionism. Christian Zionism is defined loosely as unreserved support for the actions of the present nation of Israel justified by a misguided belief that Jews must be re-gathered to their ancient lands prior to the Lord’s return. Of itself, this paper does not claim to be a work of theological scholarship, but it does lean heavily on the work of three well qualified theologians for its Biblical accuracy and continuity. The study of theology depends on both the sincerity and the humility of a scholar in order to permit the Scriptures themselves to interpret Scripture. To this exercise we truly bring …….no new thing. Faithfully using this method avoids the human pitfalls of presuming the meaning with only partial information or bringing preconceived human notions to the Bible in order to justify them. After some years of casual study, I conclude that the sources I have used are faithful to the whole counsel of God and that this paper is worthy of your consideration.. I contend that a great many Christians are supporting a Zionist regime because they assume that Dispensationalism, the popular eschatology of our time, is the only option. If this is your position, you will for certain have come under pressure to support Zionism which lays aside all the Christian principles you have learned in the Sermon on the Mount for policies that are nothing short of “Apartheid” toward the Palestinians. I urge you therefore to carefully re-consider the matter so that your support is properly placed in the cause of justice and mercy. Without doubt, the present nation of Israel, reconstituted in Palestine, by a unilateral United Nations decree dated at sundown 14 May 1948, has been responsible for disturbing years of peaceful coexistence between Jew and Muslim in the land . Wherever there is controversy, books and articles follow passionately written from differing points of view each seeking to explain or justify one side or the other. This is doubly so in this case because the arbitrary decision to insert a nation called Israel into an already settled Palestine was pre-loaded with religious implications for three of the world’s major religions – Judaism, Islam and Christianity. The purpose then of this paper is to republish the historical Biblical interpretation of God’s promises to Abraham, which if graciously received, will bring a correct perspective to Christians who want to do the right thing by the Jewish people and to also promote peace in a troubled area of the world. Contrary to the world’s historical record, the Christian worldview itself is not antagonistic toward the Jews. However, confused persons through the centuries, who have claimed association with Christianity have been intensely anti-semitic to the extremes of tragic persecution and death. The Bible tells the story of Abraham and the promises made to the natural and the spiritual seed. If we understand and embrace this interpretation as the Divine plan, we will not become pawns in support of the present day Israel’s irrational drive for racial mastery in the land of Palestine. To begin, if God in three persons, planned before the foundation of the world to rescue a people for His Name, (the Church), then that plan must emerge in Genesis and conclude in Revelation and the whole counsel of God on the matter be complete in Holy Writ. As difficult as it may seem to our sense of fairness, God chose some from Abraham’s family to be the Spiritual Seed who would believe the Gospel of a coming deliverance through a Messiah, and he left the rest in their unbelief. This is a type of the Lord’s crucifixion. As the Hebrews were protected by the blood daubed about the door, all who are covered by Christ’s blood sacrifice will look to Him and be justified (made righteous) and live forever. (8) Those that do not, though they live for a time on earth, are under an eternal sentence of death. The Exodus from Egypt is the saga of God’s patient work with an earthly people to whom he gave the Law and the Oracles . Yet despite the Red Sea crossing , the firey pillar, the manna and quail, the rock in the desert that spewed a river of water, the people built an idol at the foot of the mountain while God was writing the 10 commandments on Moses’ tablets of stone (9). The majority in the nation were rebellious unbelievers and because of their failure to believe Joshua and Caleb concerning the promised land, God made them wander in the desert for 40 years until all the adults who had left Egypt had died. You can read the rest of the story for yourself as the pattern remains the same . In every generation through to the birth of the Messiah, God called only a remnant from the nation of Israel to believe the Gospel of the Messiah’s future saving work on a the Roman cross . These were the Spiritual Seed of Abraham and the remainder of the nation were left in their superstition , idolatry and unbelief. As to the land, when God promised Abraham the land of Palestine,(10) it was also a type of things to come . It’s true that following the Exodus from Egypt, Joshua more or less conquered the land. But Israel, because of disobedience, had only partial success through the time of the Judges and the Kings. Rebellion and unbelief eventually caused them to be judged for their idolatry and taken into captivity in Babylon. When Abraham received the land promise he knew that he was not looking for the ultimate fulfillment of the promise on earth (11) . Abraham knew that if Israel as a nation was to bring forth the Messiah, an earthly territory would indeed be necessary, but he also knew that the land was a type of a heavenly kingdom which he would one day see in glory. God’s promises for an eternal kingdom and eternal rights to the land of Palestine were also made Conditional. (12) If then the condition of obedience was broken what of the promise ? We know from the Biblical record in the prophets , that the majority of the people of Israel rebelled against God, burned their children in the fire to Moloch, worshipped many false Gods and forsook the Gospel. In fact, the prophets were ruthlessly killed because their message was damning to the majority conscience. (13) So God stopped sending prophets 400 years before the Messiah although there was always the Gospel by which a remnant in every generation were saved. When Jesus did come, the scribes and Pharisees had so modified the Law of Moses and the Gospel, that a whole set of human traditions had been overlaid on top of the Sinai Law perverting its meaning. When you read the Sermon on the Mount, (14) look for all the corrections Jesus made to their errors. They hated him for it, for they had what they wanted ,- respect from men. As far as they were concerned, any and all excuses to reject Jesus’ authority over them were valid. The crucifixion without doubt is the pivotal point in history. The Old Testament and New Testament are on different sides of the crucifixion, yet they both proclaim that the Gospel of the Lord Jesus Christ is the same and Jew and Gentile from Abraham to the last trumpet are now members of the Bride of Christ – the Church. When Jesus died the veil of the temple, the heavy curtain through which only one priest per year passed to offer sacrificial blood for atonement, was ripped by God the Father from the top to the bottom because a Holy of Holies was no longer needed. The Priesthood of the Believer had been established . destroyed the last vestiges of the nation and its religion by slaughtering the inhabitants of Jerusalem and destroying the temple completely . The Lord predicted this would happen for with His ascension to his Heavenly throne and the sending of the Holy Spirit at Pentecost, the “Israel of God” was now proclaimed a spiritual kingdom. There was no further need of earthly types. The Nation of Israel had fulfilled the purpose for which God had brought it into existence in the land of Palestine and it is now gone forever. The Bible needs no other support, but it is significant, that some important sects who are current followers of Judaism agree that God has never recalled Israel, to the land. At Pentecost , as Jesus promised, the followers of Christ were visited by the Holy Spirit and empowered . In one day 3000 souls from many nations and tongues were converted to begin spreading the message out across the world . So what of the Jews ? Is God finished with them? Following the destruction of Jerusalem by Titus the Jews were dispersed throughout the nations . They clung to the memory of their Old Testament privilege and based on portions of Old Testament scripture called the Talmud, they founded the religion of Judaism . Over the centuries their have been many conversions to Judaism among non-Semite peoples . So who among the Jews today, are Abraham’s natural seed? I am sure there are many, but not one of them is able to trace his lineage with any certainty to the Jews of Jesus time. Therefore any self-proclaimed racial identity is a voluntary willingness to be associated with either the religion of Judaism, the present Jewish culture or the political movement Zionism. This knowledge does not define the day or the hour of the second Coming but the Holy Spirit through Paul does promise that God will save his people the Jews before Jesus returns. As in every age, there has been a remnant of believing Jews and so there will be again. The Jews as individual persons will be converted wherever they are on the earth and their conversion grafts them into the Church, the Bride of Christ and the Heavenly Kingdom. The land of Palestine or the current nation of Israel is irrelevant to the fulfillment of this prophecy. None of the New Testament writers make any reference to a re-gathered Jewry in the land of Palestine. The apostles agree with Abraham that they look for a heavenly Kingdom which is far better than an earthly one. (20) Admittedly this is an argument from their silence, but the New Testament writers were all Jews and they were under pressure from the Jews who were certain that the Gospel of Jesus Christ was bent on destroying their religion. Surely, under the circumstances, if national Israel was to be a factor in the future, the apostles would have mentioned it. So how should this impact your view of the present tragedy in Palestine ? Using the Nazi Holocaust for all its worth and more, the Zionist movement has persuaded much of the western world to hold their peace while they carry out “ethnic cleansing” on the Palestinians, wholesale expulsions from their historic lands, and acts of aggression against neigboring Arab nations — all in the name of a resurgent nation of Israel. If the historical perspective in this paper is correct, many Christians are in real danger of being complicit in quietly accepting the Zionist Program for reasons that are not Biblical. The Zionists are not Joshua cleansing the land under God’s specific instructions; Orthodox Jews who have lived peacefully for centuries in the land of Palestine, oppose Israel because they have no confidence that God has ended the Diaspora ; …and finally, the Lord Jesus Christ has given us the Sermon on the Mount to guide us in our behavior and all Christians should therefore be compelled by conscience to advocate a peaceful compromise that foundationally, establishes true democracy and human rights for all ? The follwoing article was written by the Rabbis of Neturei Karta. They challenge the Zionist understanding of the meaning of the Holocaust and reject the Zionists efforts to use the Holocaust as a means to further Israel’s political goals and oppression of the Arabs of Palestine. On January 27, 2014, the largest ever delegation of Knesset members will convene on the grounds of Auschwitz together with Holocaust survivors, for a gathering on combating anti-Semitism. The Israeli delegation will include senior representatives of the IDF and the Chief Rabbis of the State of Israel. They will be joined by a large number of elected officials from around the world, including Europe and a senior bi-partisan group of leaders from the U.S. Congress. Once again, the Zionists are using the Holocaust to justify and gain support for their state. The blood of the six million cries out to us from the earth, and we are outraged. Who gave the Zionists the right to use our grandparents’ blood for their political purposes? The irony deepens when we look back at history and see that while the Holocaust was happening, it was the Zionists who refused to lift a finger to rescue Jews. With the infamous slogan “Only through blood will the land be ours,” they passed up rescue opportunities in the hopes that if the Jewish people suffered enough, the post-war world would grant them the state they so desired. Today’s Zionists are no better. Publicly they bemoan rising anti-Semitism in Europe, but privately they rub their hands and think of all the new immigrants to the State of Israel this will produce. Furthermore, it is they who are most responsible for causing today’s European anti-Semitism. The false stereotypes of the Jew propagated by the Nazis are long gone, but new hatred has been aroused by the Israelis’ stealing the Palestinian people’s land and not allowing them to return to their homes or enjoy basic rights. This might well have remained only anti-Zionism, not anti-Semitism, had the Zionists not insisted on claiming to be the representatives of the Jewish people. Nowhere is this more glaring than in the current memorial ceremony at Auschwitz, where the Jewish people – who suffered in the Holocaust – is represented by the Knesset and the Israeli army. This is not to mention the new anti-Semitism in the Middle East, which is completely a product of Zionism. Prior to Zionism, Jews lived for centuries alongside Muslims and Arabs throughout the Middle East, including Palestine, in complete harmony. The Torah teaches that Jews are in exile and must respect the nations among whom they live. The Torah forbids Jews to have their own state. It goes without saying that Jews are forbidden by the Torah to steal land, kill or expel anyone. And precisely because we the experienced of the Holocaust, our tolerance and respect for others should be enhanced – not use our suffering as an excuse to oppress others as the Zionists do. We firmly believe that following the path of the Torah is the only and best way to prevent future anti-Semitism. With all of the above in mind, the current Zionist ceremony is nothing less than a brutal affront to the memory of those who perished in the Holocaust. May the Almighty protect His creations from any future genocide. May G-d bring about a speedy and peaceful end to the Zionist state, and may Jews and non-Jews live peacefully together everywhere in the world.